Babylonian amora of the fourth century; contemporary of Papi (B. B. 52a; 'Ab. Zarah 40a). 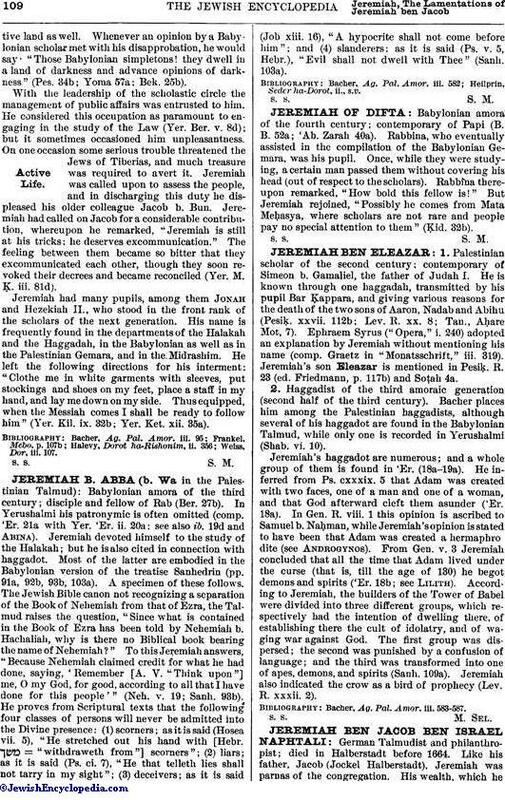 Rabbina, who eventually assisted in the compilation of the Babylonian Gemara, was his pupil. Once, while they were studying, a certain man passed them without covering his head (out of respect to the scholars). Rabbina thereupon remarked, "How bold this fellow is!" But Jeremiah rejoined, "Possibly he comes from Mata Meḥasya, where scholars are not rare and people pay no special attention to them" (Ḳid. 32b).